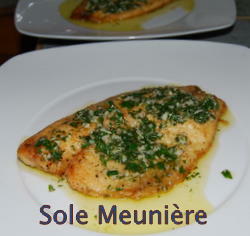 Sole Meuniere (miller's wife), is a classic and simple French fish dish, now mainly forgotten. 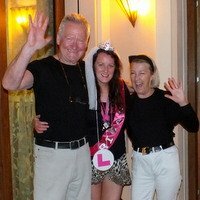 The miller's wife would have had access to plenty of flour to coat her Sole before cooking and was probably a good plain cook with few airs and graces. We have adapted the original recipe just a little with the addition of Olive oil and Garlic and the result is something very special. 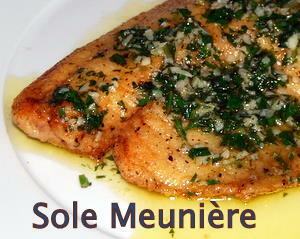 Just follow the step-by-step recipe below and you can be eating Great Sole Meuniere tonight. 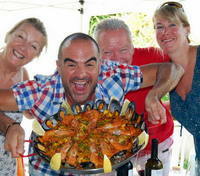 A great recipe for your Mediterranean Diet. 4 Good sized fillets of Sole - Dover Sole is best, but Lemon Sole and Tilapia work well too. 2 Ozs./50g. of plain flour. 2 Tablespoons of good extra virgin olive oil. 1 Large lemon (juice of). 1 Handfull of flatleaf parsley (chopped). Season the flour with plenty of salt and black pepper and coat the Sole fillets well making sure to shake off any excess flour. Heat the oil and butter together in a large non stick fry pan (the oil will stop the butter from burning) and add the fish fillets. Cook gently on both sides for about ten minutes (depending on the the thickness of the fillets), until cooked and golden. Remove the fish from the pan and keep it warm. Now add the garlic to the pan and cook (gently) for about two minutes. Finally - whisk in the lemon juice - check for seasoning and you're ready to serve. Arrange the fish fillets on four plates and spoon over the sauce. Finish with a final sprinkling of parsley.